"I am firmly convinced that truly great music must in all its roots be linked with folk foundations, with the eternally youthful, inexhaustible sources of artistic folk creativeness." With these words Khachaturian expresses more than a mere willingness (as a Soviet artist) to adhere to the communist party line and comply with the declared aesthetic requirements of the time. All his great works reveal his being inspired by folk music, Armenian and Georgian in particular, which shaped his thinking as a composer. Gayane, Masquerade and the Violin Concerto (here featuring a bravura performance by Leonid Kogan) need no introduction. Noteworthy too is the sterling delivery of the young pianist Antonin Jemelik in the recording of the Piano Concerto with the Czech Philharmonic Orchestra. 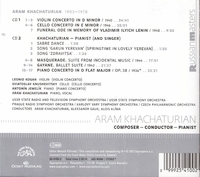 In a series of previously unreleased, newly remastered recordings from the 1950's, Khachaturian appears in the role of conductor, while several unique recordings capture him singing his own songs in Armenian by the piano. Soviet composer, conductor and spontaneous musician - the three faces of Aram Khachaturian."